A very healthy and innovative cutlet recipe which includes all the vegetables, made in an interesting way and is NOT deep fried but Airfryed. Heat the milk in a pan or Kadai. Once heated add all vegetables and cook for 2-3 min till the vegetables becomes soft and tender. Put salt and black pepper. Add semolina and cook for atleast 10 min till it thickens and leaves the sides of the pan. Grease a flat plate and spread the mixture on the plate with the help of a katori or bowl. Keep this mixture in refrigerator for 3-4 hours or in freezer for 1 hour till the mixture firms up. 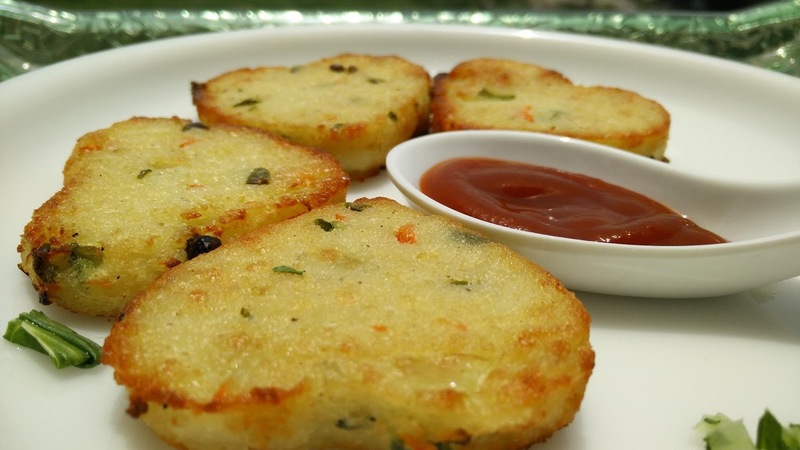 Take out the mixture from the freezer and cut into desired shape of the cutlets. Coat with little oil and put in a preheated airfryer for 10 min at 180 degrees. Serve hot with sauce and enjoy the monsoon season. Note: Another option is that before putting in airfryer, the cutlets can be dipped in a batter of gram flour and water and then it can be air fryed.